Beetle Beds, Blue Hair and Bin Cymbals: A weekend in Berlin. It’s been a little while since I last blogged, and that is due to two things. Firstly, the inevitable happened: I got a cold. I spent a lot of last week unintentionally Tweeting grammatical errors and typos, as well as feeling incredibly sorry for myself and trying to decipher German medicine instructions through a cracking headache and very blurry vision. Against all odds, however, I am still alive, which meant I was free to do the other thing which has prevented writing: a little weekend away in Berlin! A group of six of us travelled three hours East from our beloved Hamburg across to Berlin on Einheitstag (Day of Unity) and stumbled across the huge celebrations happening in front of one of the most famous landmarks which Berlin has to offer. 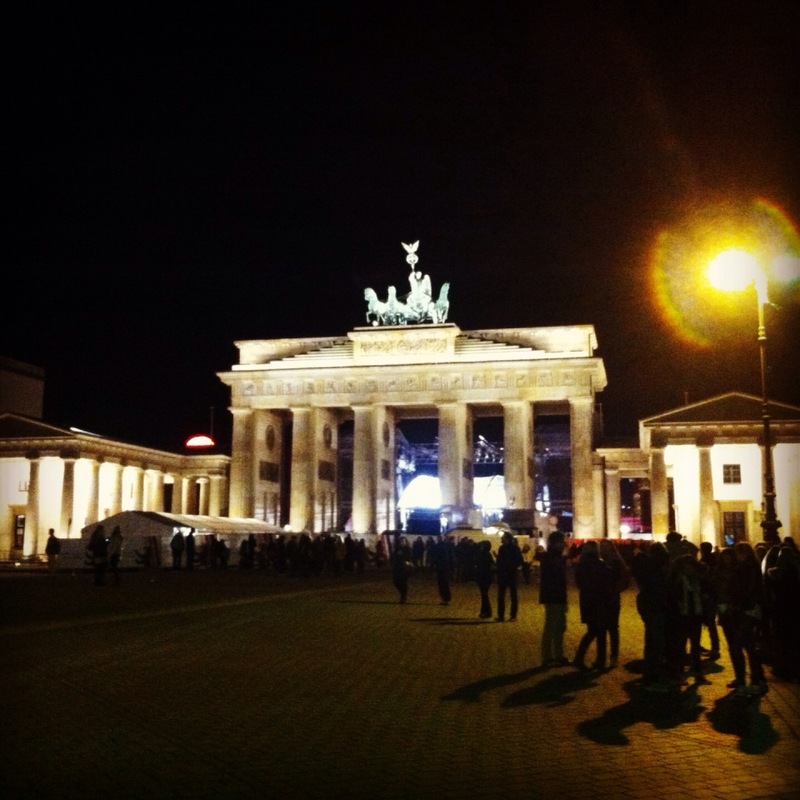 Here’s a little photo from behind the Brandenburger Tor (Brandenburg Gate). Now, I’m all for a good celebration, don’t get me wrong. What I didn’t really get, however, was why the British band The Wanted were the headline act on Einheitstag itself. It seemed an All Time Low, and the spectators were more excited about the red, black and gold confetti at the end of their set, than the set itself. We did find out that The Wanted have a contract with Coca-Cola, who were sponsoring the event. I didn’t want to Lose My Mind about it, but it still would’ve been great to have a famous German act to round off the day’s celebration, although I was still Glad [I] Came. Along with the Brandenburger Tor, we did a lot of sightseeing, from the Dali Museum to the Berliner Dom (Cathedral) to the East Side Gallery (the largest remaining part of the Berlin Wall), and returned, exhausted, to our hostel each day. We were staying in the ‘vibrant’ and ‘eclectic’ (scary, basically) area of Kreuzberg, which has lots of popular night-time haunts for locals. The selling point of our hostel is an old purple VW Beetle which has been converted into a bed, which happened to be in the 10-person dorm we were assigned to. As you can imagine, everyone wanted to be in the Beetle Bed, why on earth wouldn’t you? Unless you don’t like confined spaces of course, dear Reader. But it was already taken by a girl in the room, and one member of our group in particular kept a beady eye on this girl’s movements, ready to pounce when she checked out. It was not to be though, due to someone who will be remembered long after this trip. We shall call him Blue Hair (not a code name- he actually had blue hair), and he had snoring capabilities with such a force that they could knock over a small child and probably wind a larger one. As you can imagine, someone with talents such as this was not a popular man in a 10-person dorm. Oh no. He snored on our second night and on our third and final night, but a sore spot was really that he took the Beetle Bed. As it turns out, Beetles aren’t very well soundproofed. Things worsened, however, when on our final night, he and his friend were both snoring in unison. One from one side of the room, the other right next to us in the Beetle Bed. We had joked at one point, should our blue-haired friend snore again, about pelting the Beetle with the peppers we’d bought from the local Lidl. But in a pitch-black room at 4.30am, the prospect of angering a 17-stone blue-haired Eastern European man, whose powerful snoring is probably only matched by his powerful punch, seemed somewhat less attractive. The Italian man at reception thought we had a problem with a smell in the room, not a symphony of snoring, so when he came to our room armed with a lack of ideas and the German equivalent of Febreeze, it was fairly clear that he wasn’t going to be able to ensure much sleep for us. This was when things became a bit mad. The consensus in the room was to try to wake the main culprit and ask him to turn on his side, but no amount of gentle knocking on the window of the Beetle would disturb him from his deep sleep. And so, dear Reader, it was time for the bin cymbals. The bin in the room was of the metal variety, and so was loud regardless of how gently the lid was lowered. This made an effective cymbal but still did not wake him. He wasn’t even disturbed by the lights being turned on. Annoyed, yet somewhat impressed by his deep-sleeping capabilities, we all resigned ourselves to the fact that sleep just wasn’t going to happen. Having not exactly made many friends in the hostel, we checked out a few hours later and wandered around more of the interesting areas which Berlin has to offer. Speaking of interests, you may or may not know that I’ve got more than a slight interest in all things Ancient Egyptian. The Barnard family went to Luxor back in 2000, and everything we saw really captured my imagination. Having returned to Egypt with friends this past summer (not to Cairo, don’t worry) we were a little too far away and a little too scared of getting caught up in riots to see any more of the historical wonders the country has to offer. 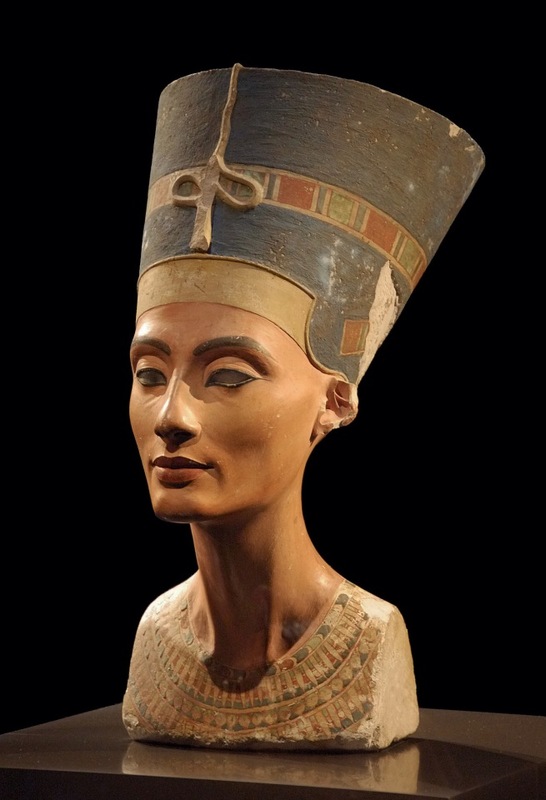 So, when I discovered that the famous bust of Queen Nefertiti is housed in Berlin’s Neues Museum, I was desperate to finally go and see it. If you don’t know it- here’s a photo. Thank you, Wikipedia. It was just as beautiful as everyone says it is. 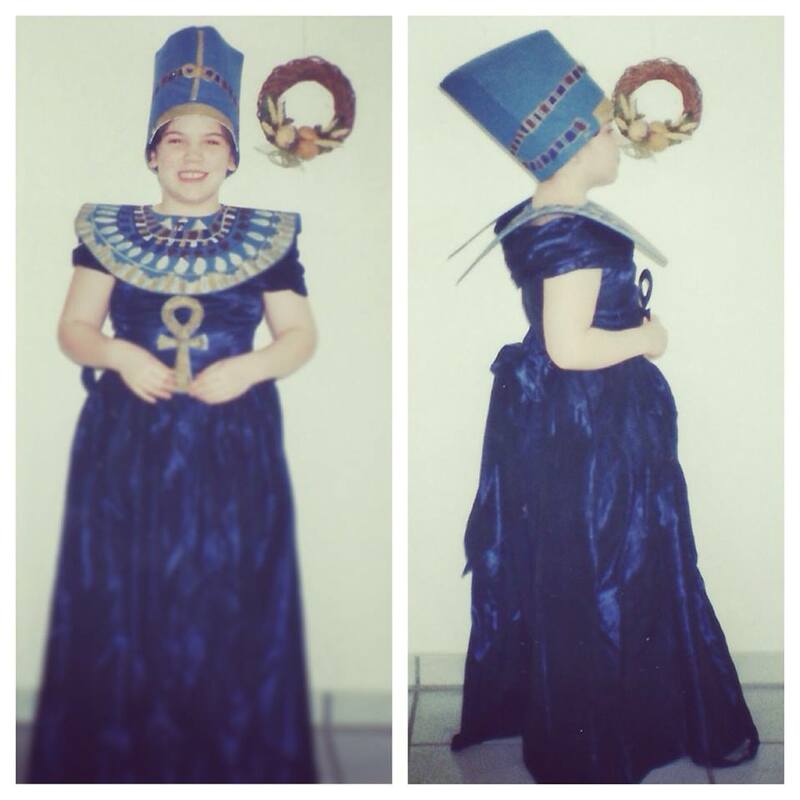 I was so taken by it after seeing pictures back in 2000, that in 2001 at the age of 8, I decided to pay homage to Nefertiti at our local Karnival. This must have been only a few months short of us moving back to England after six years in Rheinland-Pfalz, which was probably just as well after I embarrassed myself in the best and most-photographed way possible: fancy dress. I am much less cute than I remember, but at least I won on the day. In the unlikely event that you, too, have been inspired to look like Nefertiti, the crown and collar were made from blue foam sheets, lots of glue and enthusiasm, and the gems drawn with coloured permanent marker. The dress was handmade back in the day by none other than Mrs Karen Barnard (she was possibly still a Jones when the dress was made- I need to check my facts). And so now I am back in Hamburg in my little flat, and if anything, the weekend away has shown me just how much I love it here. Berlin may be the capital, but Hamburg is wonderful. Although I’m just a little bit biased, I would really urge you to take up the chance to come here if you can. The U-Bahn is a lot cleaner and less complex here than in Berlin, too. Just saying. Dear Reader, I think I’ve lost my heart to Hamburg, and I could not be happier. i just freakin enjoy reading this. keep it going! Thank you Martin! I enjoy writing the blog, so I’m really happy you like reading the posts! ← Updates and more awkwardness for you to enjoy.